Taking care of your body should be a part of your daily routine, especially in the cold season. I always considered that it is better to prevent than to spend lots of money on miraculous treatments. One way to maintain your skin smooth is to use a good body scrub twice a week. 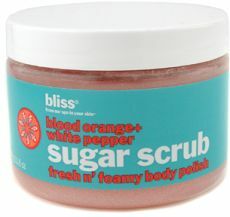 If you want to find out more, compare and research body scrubs. Guinot is one remarkable French cosmetics brand to create excellent products to pamper yourself. Smoothing Body Scrub is a delicate scrub, suitable for all skin types, to help you get a healthy looking skin. It eliminates dead cells instantly and has a subtle scent. Celluli Laser Scrub Starter Slimming Exfoliator – Biotherm is one special formulated body scrub to eliminate cellulite after a couple of uses. It is perfect for massaging problematic areas such as thighs, abdomen, and buttocks. For better results, it is recommended for using it before a slimming treatment. One yummy body scrub is Blood Orange Plus White Pepper Sugar Body Scrub from Bliss. The clear jar hides pinkish granules that gently polish skin to remove dead cells. It also moisturizes skin due to its sunflower oil and anti-oxidants complex. 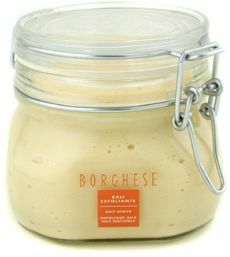 One creamy scrub you should try is Sali Esfoliante Salt Scrub manufactured by Borghese. Its botanical formula removes impurities and leaves skin soft and supple. It is packed in a lovely 16oz jar. 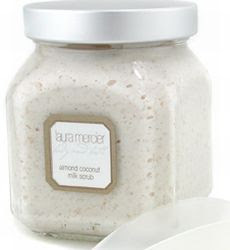 I love coconut smelling body products and Almond Coconut Milk Scrub by Laura Mercier could not have missed this list. The sugar granules gentle exfoliate skin and make skin glowing. The scrub also contains grape and olive oils to deeply moisturize skin. I truly recommended it for using it in the cold season. The next scrub reminds me of luxurious spas. 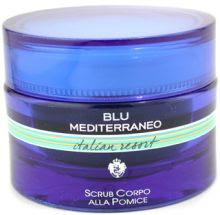 Blu Mediterranean Italian Resort Body Scrub contains marine salt, jojoba powder and volcanic pumice – used to deeply exfoliate skin. It regenerates tired looking skin by restoring its natural glow.